You have been predicted -- by companies, governments, law enforcement, hospitals, and universities. Their computers say, "I knew you were going to do that!" These institutions are seizing upon the power to predict whether you're going to click, buy, lie, or die. 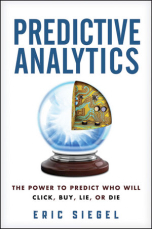 Predictive analytics unleashes the power of data. With this technology, the computer literally learns from data how to predict the future behavior of individuals. Perfect prediction is not possible, but putting odds on the future -- lifting a bit of the fog off our hazy view of tomorrow -- means pay dirt. How companies ascertain untold, private truths -- how Target figures out you're pregnant and Hewlett-Packard deduces you're about to quit your job. Predictive analytics transcends human perception. This book's final chapter answers the riddle: What often happens to you that cannot be witnessed, and that you can't even be sure has happened afterward -- but that can be predicted in advance? Whether you are a consumer of it -- or consumed by it -- get a handle on the power of Predictive Analytics.